NI21 MLA for South Down John McCallister has pledged his support for the dementia friendly communities programme which focuses on improving the inclusion and quality of life for people with dementia. Mr McCallister has praised Alzheimer’s Society’s five year strategy which includes a key ambition to work with people affected by dementia and key partners to define and develop dementia friendly communities. He said: “Here in South Down we have a large ageing population and I would like to see a dementia friendly community – one that is more inclusive of people with dementia, and improve their ability to remain independent and have choice and control over their lives. 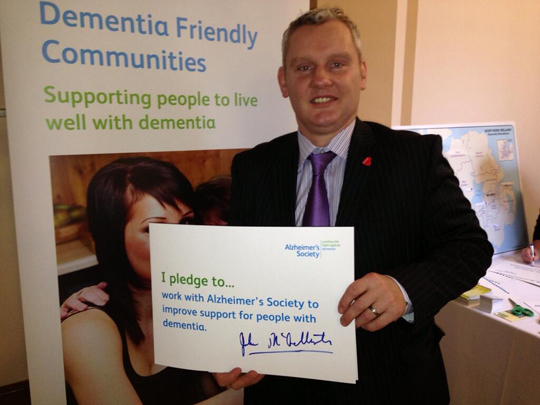 NI21 deputy leader and South Down MLA John McCallister supports dementia friendly communities.